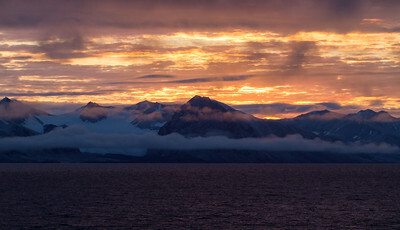 Up at 3am, just in time for the hour long deep red sunrise as the ship bobs around the extraordinary fjords of the north. 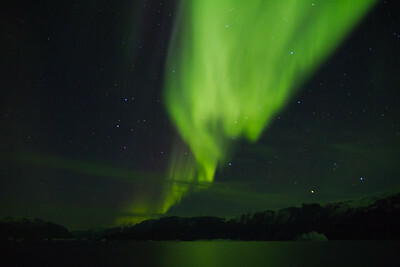 Up at 1am, lying on the deck as the aurora borealis start to rain down. 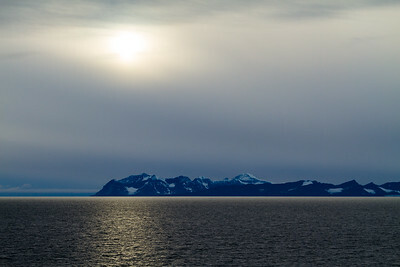 Abandoning lunch to take another view of the ridiculously epic scenery of the west coast of Greenland. 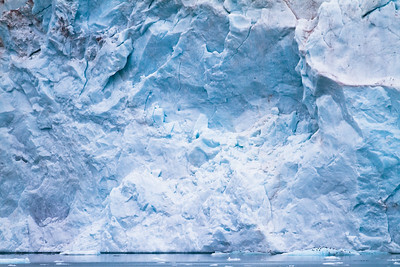 Abandoning ship to take Zodiacs around the transient icebergs and glaciers. Slowly, patiently ascending hillsides alone, to get close enough and with respect for the Arctic hares playing on the other side. 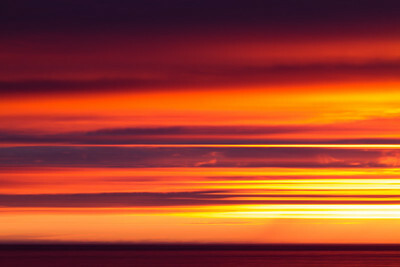 This is wilderness; this is life. 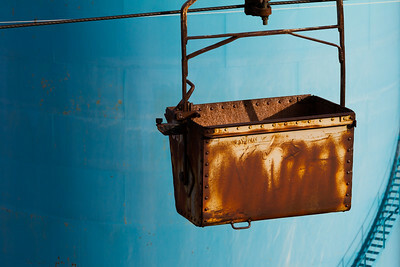 An old empty mining transport bucket is suspended in front of more recent and vibrant constructions, in Longyearbyen, Spitsbergen. 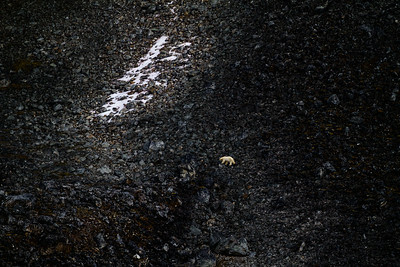 A polar bear slowly ascends the black rocks of Magdalenefjorden in Svalbard. 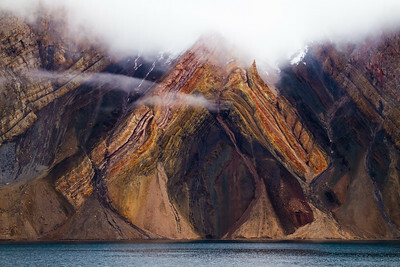 A massive geologic fold erupts from the steep slopes of King Oscard Fjord, highlighted in the vivid reds and orange of this V shaped formation. 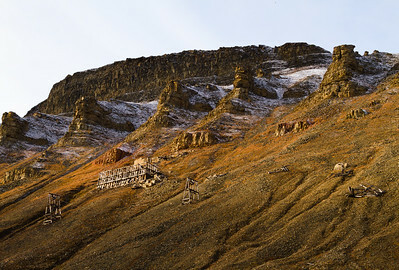 High on the steep slopes surrounding Longyearbyen, abandoned wooden structures hint to a mining past. 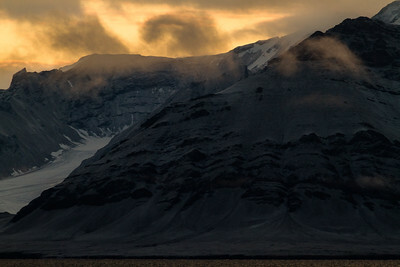 The mountains of St Johnsfjorden sizzle beneath a fiery Svalbard sunrise. 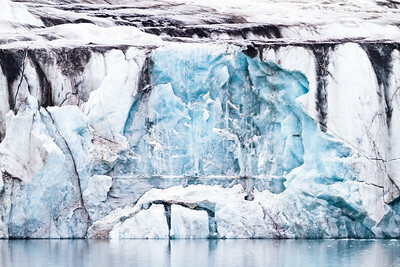 A gothic ice formation resembles a waterfall both above and in the descent, in St Jonsfjorden, Svalbard. 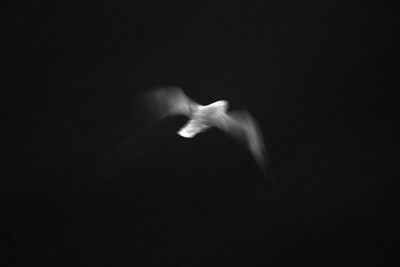 In natural light, a fulmar is caught against the black ocean in this slow exposure on the voyage to Greenland. 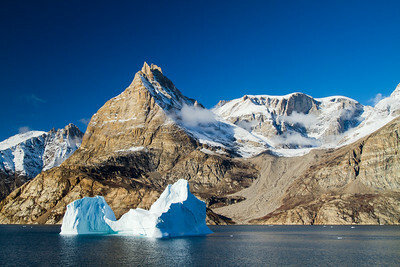 Two towering icebergs stand firmly in the freezing waters of Scoresby Sund, in Eastern Greenland. 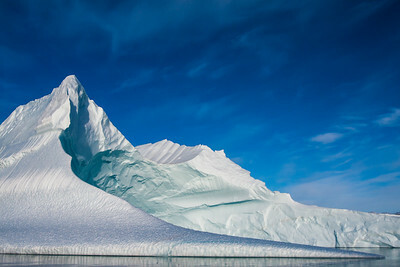 Both layered in contrasting ribbons of smooth and fluted ice, the top of the right berg is lit by the sun like a glowing blue torch. 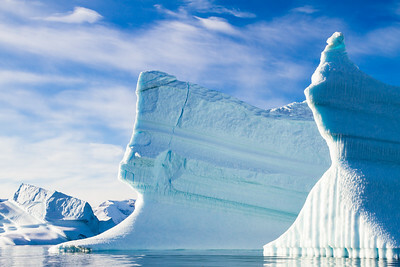 Lit like metallic ice-cream, a large sculpted iceberg sits under a wide blue sky in Scoresbysund, Eastern Greenland. 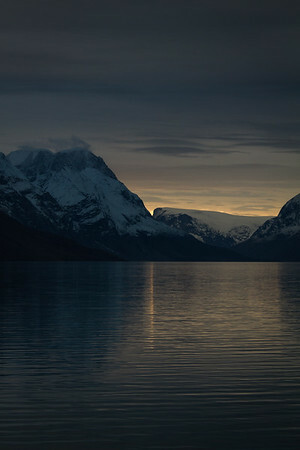 The final moments of sunset diffract up and through the narrow conjunction of two Arctic mountains, reflecting as a thin line across King Oscar Fjord, and peace descends over the landscape. 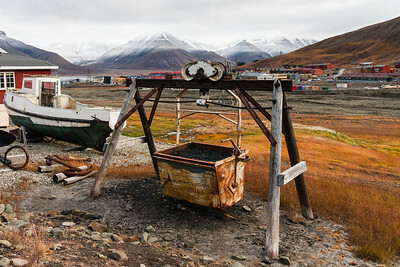 A mining bucket is suspended outside a small museum in Longyearbyen, Spitsbergen. 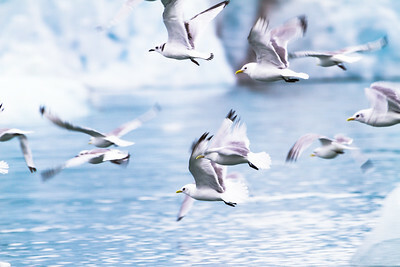 Scientific name: Rissa tridactyla; black-legged kittiwakes Location: St Jonsfjorden, Prins Karls Forland, Greenland Description: Startled by a glacier calving, the kittiwakes took to the sky in a flurry of activity, their white feathers contrasting beautifully against the blue of the fjord and ice. 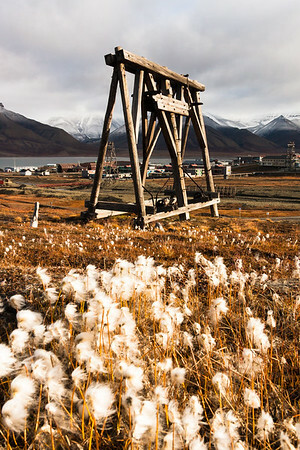 Abandoned mining structures dot the terrain around Longyearbyen, Spitsbergen, surrounded by Arctic cotton grass. 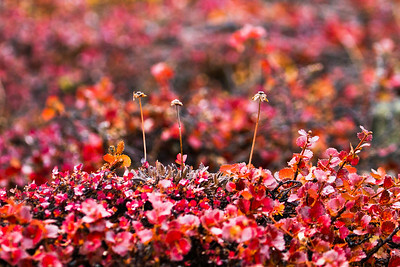 Tiny 'trees' emerge from the Greenland landscape - I think these red leafed plants are dwarf birch (Betula nana) but would need confirmation. 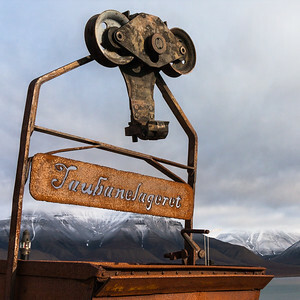 One of the many historic artefacts dotted around Longyearbyen, Spitsbergen, this 'Taubanelageret' bucket literally translates to 'cableway store' and was used to transport coal and minerals from the mines far up the slopes down to the main town and docks. 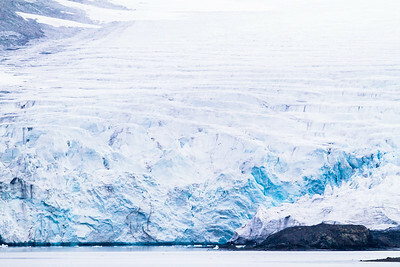 Repetitive rifts can be seen in a glacier descending to the sea in St Johnsfjorden / Prins Karls Forland in Svalbard. 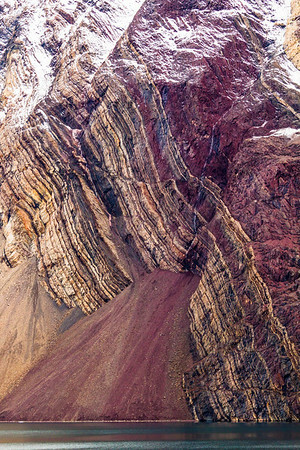 These crevasses are caused by the constant movement of the glacier, causing tension between solid plates and the subsequent fracturing at weak points. 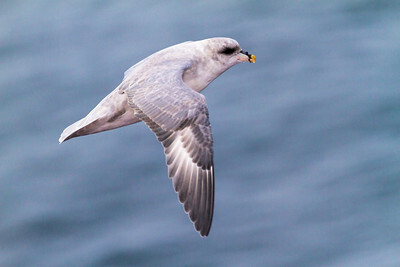 Fresh from a sea dive, a fulmar rises up for another attempt near Svalbard. Kittiwakes nestle on icebergs created by the calving glacier in the background. 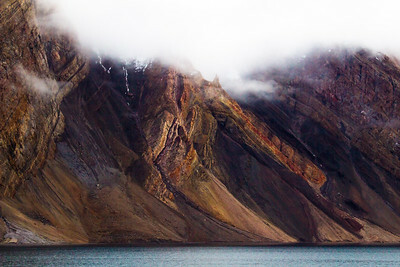 Autumnal colours surround a reflected mountain near Longyearbyen, Spitsbergen. 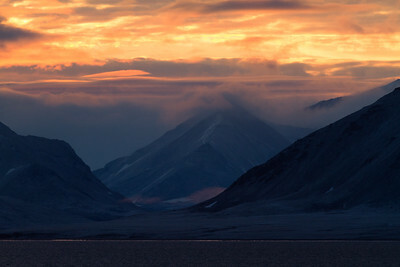 The distant peaks of Svalbard huddle under a cold winter sun in the Arctic. 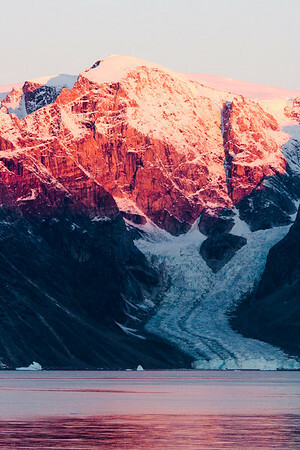 Fog turns to glacier turns to ice turns to water as it meanders, over the ages, through the twisting hulks of rock on the Greenland coast.